Rabies is a lethal disease in humans and animals, killing approximately 60,000 people every year. Currently, there is no treatment available, except post-exposure prophylaxis (PEP) that can be administered whenever exposure to a rabid animal took place. 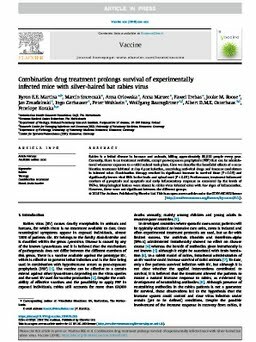 Here we describe the beneficial effects of a combination treatment initiated at day 4 post infection, containing anti-viral drugs and immune modulators in infected mice. Combination therapy resulted in significant increase in survival time (P < 0.05) and significantly lowers viral RNA in the brain and spinal cord (P < 0.05). Furthermore, treatment influenced markers of pyroptosis and apoptosis and early inflammatory response as measured by the levels of TNF-α. Morphological lesions were absent in rabies virus infected mice with few signs of inflammation. However, these were not significant between the different groups.